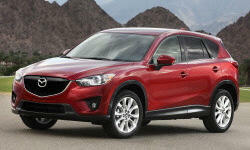 I have a Mazda CX 5 with 19 inch rims. I want to change to 17 inch with tyres with 7mm more diameter and 20 mm more width to improve gravel road handling and improved road ride comfort, ie softer feel. You'll have to plug in the two sizes to make sure the diameters are within specification of the ABS and stability control systems. If you have AWD that is another element. I changed 19" 45 profile wheels/tyres (standard on M6 Sport Nav in the UK) to 17" 55 profile, which are standard on other M6 models. No problems at all, ride and 'twitchiness' much improved, no difference to car handling, still very good. Rolling diameter is much the same, in fact a new 17" is bigger than a worn 19". GPS says the speedometer reading is within 1%, so no corrections required..
And - a big plus - both wheels and tyres are much cheaper!